Great Britain maintained their hopes of promotion to World Group II in the Fed Cup with a 2-1 victory over Portugal. 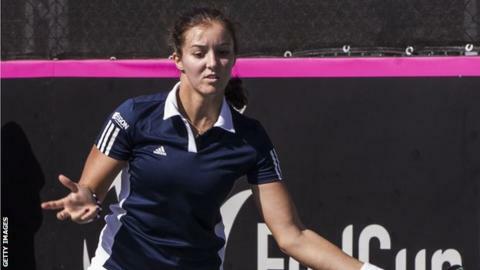 After an opening win against Bosnia-Hercegovina in the Euro/Africa group on Thursday, Britain went ahead as Laura Robson beat Margarida Moura 6-2 6-1. Heather Watson lost 6-1 6-4 in 67 minutes to Michelle Larcher de Brito. But the British number one teamed up with Robson to win the doubles 6-2 6-1 and Britain now play unbeaten Hungary in their final group match on Saturday. A total of 16 teams are in action in Eilat, Israel this week, with the four group winners competing over the weekend to decide which two will advance to the World Group II play-offs in April. Robson needed little more than an hour to dispose of Moura and said: "I'm very happy with the win, I felt quite rusty since I hadn't played a match since Melbourne. It was nice to get the team off to a 1-0 lead." World number 41 Watson was surprisingly beaten by Larcher de Brito, ranked 130th, and admitted: "I didn't play good at all today, I just didn't feel the ball well. My opponent on the other hand played fantastic, and when you mix those two, that's what happens." However, Robson and Watson saw off Larcher de Brito and Joana Vale Costa in 55 minutes in the deciding doubles to set up a crucial match with Hungary, whose top player is world number 79 Timea Babos. Speaking after the conclusive doubles win, Watson added: "I'm very happy that I could turn it around in the doubles. I think Laura and I are a great team and we combine really well together. We were very excited to get the win and put Great Britain through." To win Group B, Britain must overcome Hungary, who have completed 3-0 wins over Portugal and Bosnia-Hercegovina. Should Judy Murray's team defeat the Hungarians they would play the winners of Group D on Sunday. Bulgaria are currently top of Group D after 3-0 victories against the Netherlands and Luxembourg, with one match remaining against Slovenia. Great Britain, who made the World Group II play-off last season before losing to Sweden, are seeded second in the qualifying rounds because of the relatively high world rankings of Watson and Robson.